This week I added categories to the subscription widget for this blog. Originally the blog was only for news updates, but then I started posting tips for writers and editors. As I continue my fiction writing journey, I hope to post content related to my future books; considering this new content pushed me to make a change. I put off making this change for a while because it seemed daunting. Below, I’ve shared how I added the category capability. This is a new category as of fall 2018, and I’m not yet sure what direction it will go. It’s a place to post ideas and topics that may interest readers of my (upcoming) new-adult dystopian fiction book. Practical posts relevant to authors, including resources and ideas about the craft of writing, as well as tips on the business of writing. Practical posts relevant to editors, including tools and resources as well as the business of editing. Authors may be interested in this category as well, to learn tips that can help them self-edit their writing. 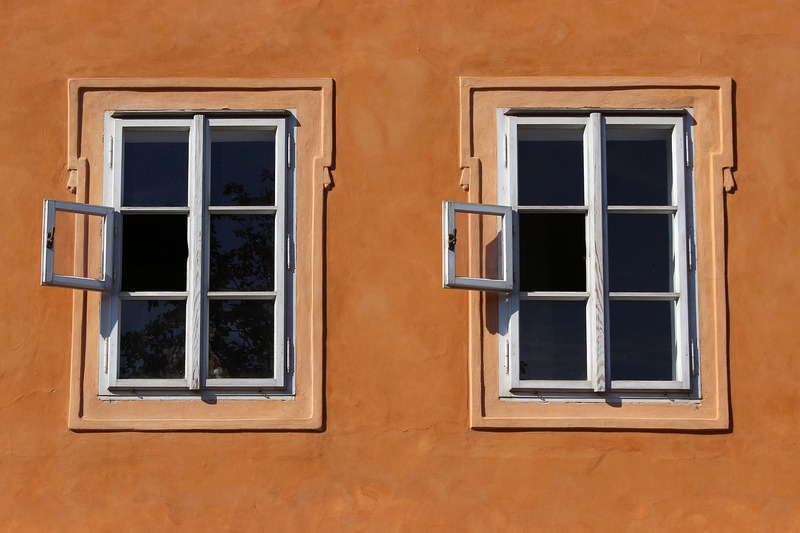 Practical posts relevant to those interested in self-publishing. The basic idea is to use an outside email service (I chose MailChimp) to manage my list of subscribers. My list will have “groups” (that is MailChimp’s term, and is parallel to the blog’s categories). Subscribers will be able to choose which groups they join. I’ll then set up an automatic “RSS to Email” campaign for each group; when I post in the News category, for example, everyone in the News group will automatically receive an email notification. MailChimp offers a free account if you have less than 500 subscribers. This free account only includes support for the first 30 days; so, plan to set up your list immediately after signing up, so that you can get help if needed. I had used MailChimp at my day job before setting up my own list. It can be a little confusing. I hope the steps below will help! Create an account at MailChimp, and answer their questions. They will automatically create your first list, with your email address in it, using the name of your business; you can change the list name if you want. This list is where you will add your subscribers. There are other pages you should look at and customize under Settings (“List fields and *|MERGE|* tags” is where you can choose which information subscribers are required to provide, for example), but this post’s focus is on creating the campaigns and a sign-up form including categories, to use with my blog. On the main menu, choose Lists. Then choose the name of the list to open it. Under Manage contacts, choose Groups. Click the gray button to Create Groups. Choose “As checkboxes” so that subscribers can be in more than one group. 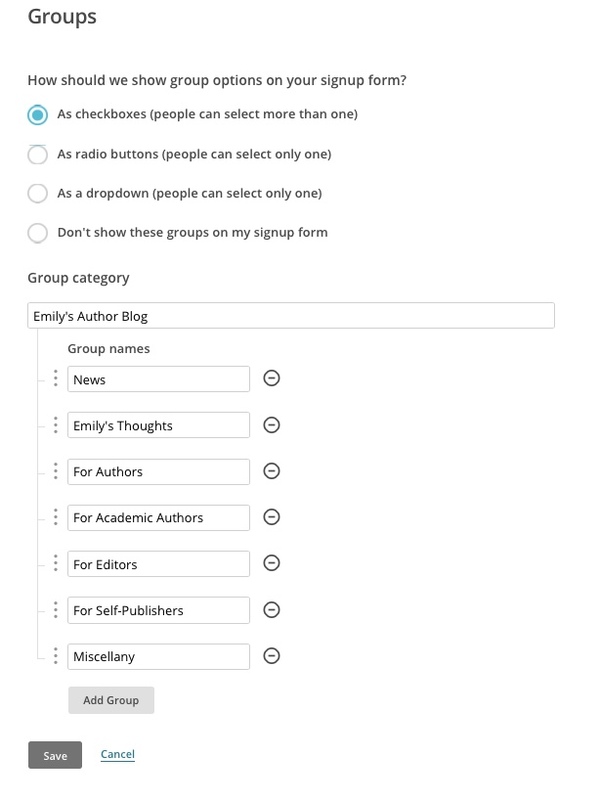 Name your Group category (I used “Emily’s Author Blog”) and then fill in your blog categories under Group names. (This is a little confusing because MailChimp uses different terminology! 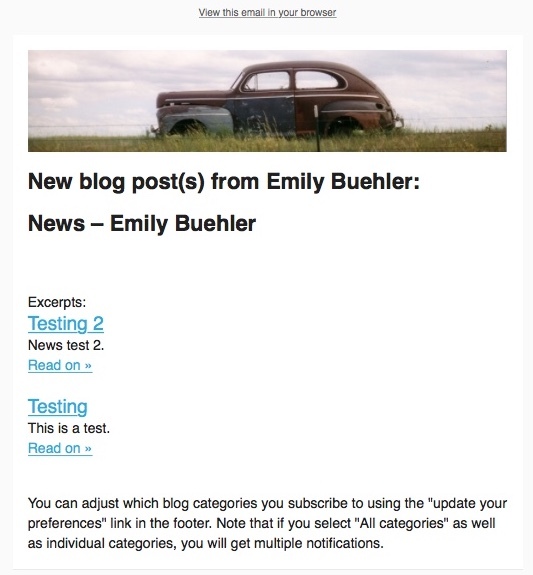 Don’t create a new group category for each blog category. * You can see mine below. ** Remember to Save. Click Preview Segment, and Save Segment. Don’t worry about the “Goose egg” screen; there is just no one in your segment yet. Name your segment and save. Now repeat Step 3 for each blog category. Note: you can’t rename a segment so get it right the first time, otherwise you’ll have to delete it and create a new one. Step 4. Create signup form. The embedded form will appear with information already filled in. You can see a preview on the right (you might need to scroll to see all of it) as well as the code. 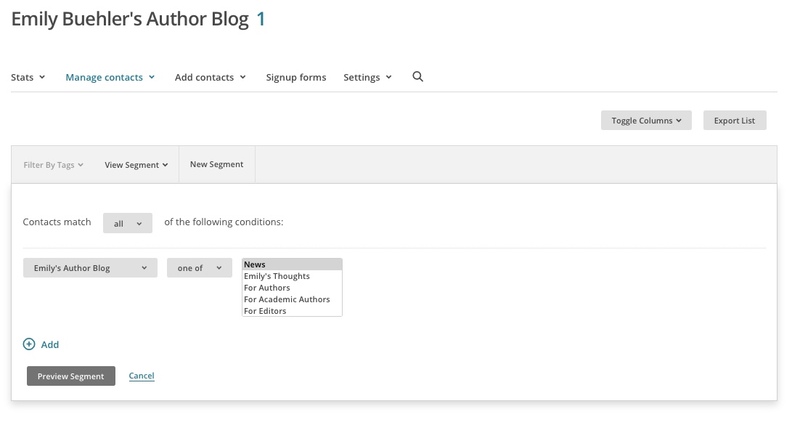 You can customize the form under Form options on the left; I changed the title, to indicate a blog. Copy and paste the code into a text file and save it. (There doesn’t seem to be a way to save it in MailChimp.) Then, paste this code into your website and the form should appear. For me, using WordPress, I used a “Custom html” widget in my sidebar, although a “Text” widget seemed to work as well. Step 5. Test the form. 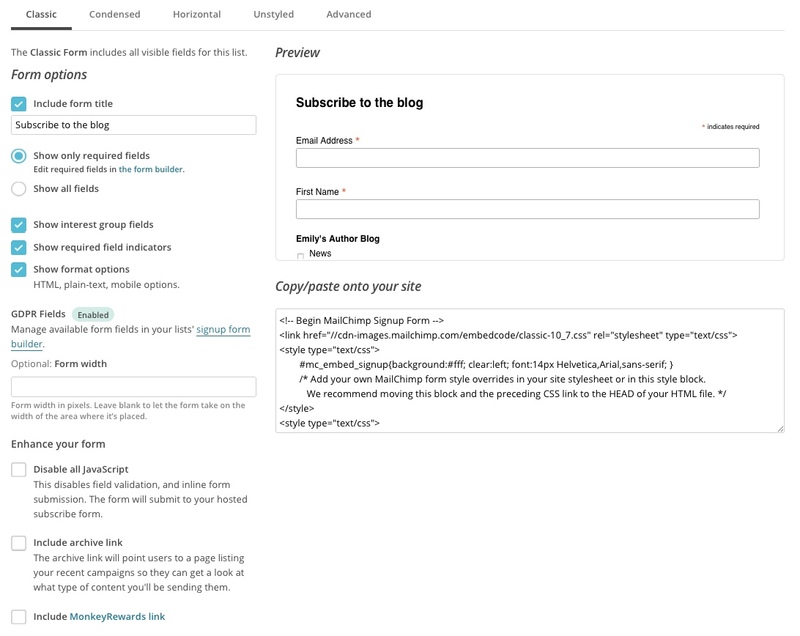 Your email address is already subscribed in MailChimp, but use the signup form on your site to subscribe to all the blog categories. 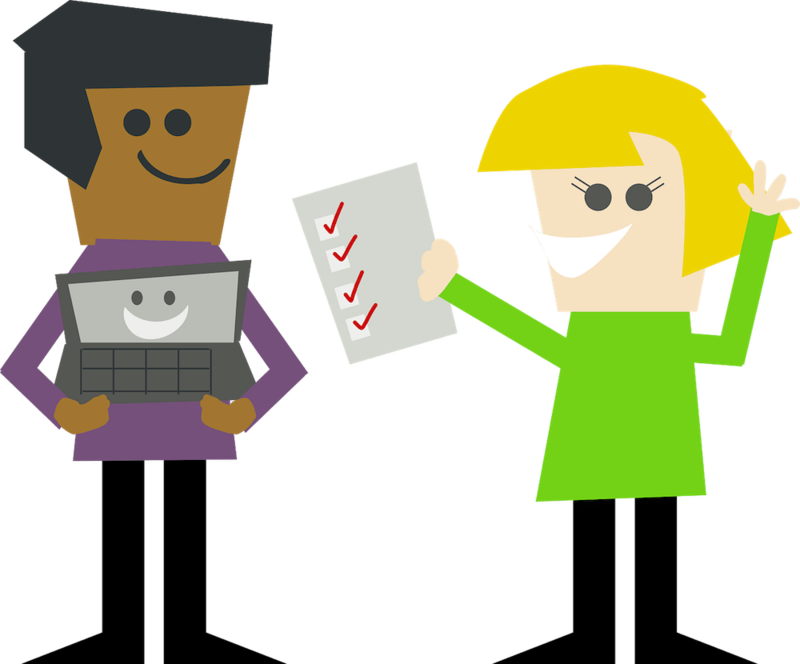 Having an email address in each group will make Step 6 easier. Step 6. Create an RSS campaign for each group (using segments). 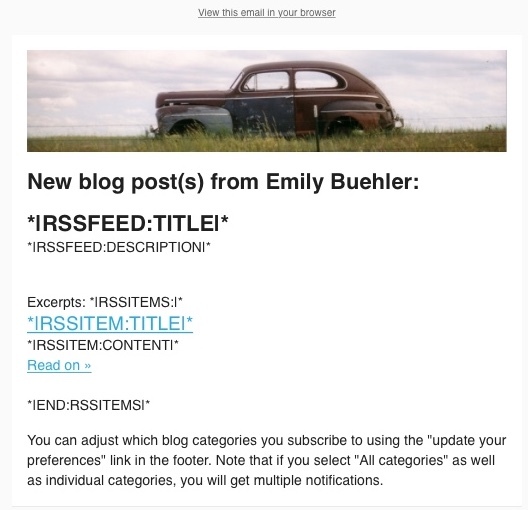 RSS Feed: Paste in the URL of the RSS feed of your blog category. I’m not totally clear on how RSS feeds work, but I think if you go to your blog, click on a category, and add “feed” at the end, the URL will become the feed URL. (You can’t see the feed on Safari; you’d need to download a feed reader app.) When you try to save, MailChimp will tell you if the feed URL is invalid. Click the blue Next button to proceed to the next step. If you need to stop working, click Save and Exit at the top right. Note that you would find you campaign under Drafts when you are ready to continue building it. Setup: I altered the From name but otherwise left the defaults in place. I selected “Personalize the ‘To’ field” using the subscriber’s first name (*|FNAME|*) because I like the idea of the notifications going to a person’s name. Note that the Campaign name is not visible to the public. Templates: This is where you start designing the actual email. 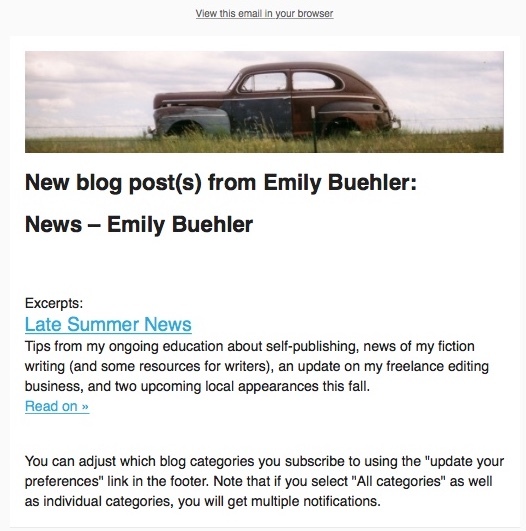 The body of the email (the links to your blog) will be generated automatically, but you might want to add a logo or header at the top, and a background color, among other things. You can build from scratch or start with a template from the Themes tab. My advice is to start simple if you are new to MailChimp. Remember that whatever you use will be in every email (until you change it); you would not want to include five photos and a lot of text introducing yourself, because your subscribers would then receive this material every time they get a notification. I wanted a simple design that would work week after week. I chose Basic, 1 column. Note that below, after designing the email, I saved it as a template. Then when I repeated this step, I used the same template, so that all emails would have the same look. 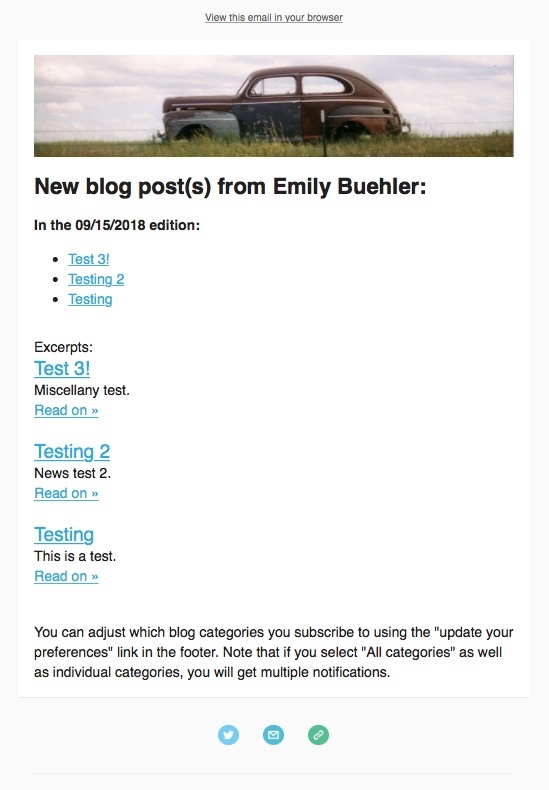 Note that, as seen in the above images, the merge tag “RSSFEED:TITLE” is being filled in with “News – Emily Buehler” while “RSSFEED:DESCRIPTION” is blank. I can try to find the place to change the title or to add a description at my blog. I can also remove either merge tag by clicking on the “RSS header” element in my email, choosing “Custom,” and editing the code. Confirm: I had an error here that no one was in my segment. I knew that my own email address was in the segment, however. I tried logging out and in, but it didn’t help. It took a whole day before MailChimp got on track and recognized that an email had been added to the segment. Once the error was fixed, I clicked Start RSS and was told that an email would go out Monday at 11 AM. It would only go to me (the only subscriber). Now repeat Step 6 to create a campaign for each of the other blog categories! Remember to use your template. Don’t worry, this step goes much faster with the template. You now have a form on your website where fans can subscribe to your blogs by category. If you collect email addresses at events (note: you need permission to subscribe people), you can add them to your list and to the various groups from inside MailChimp (open the list and use the Add contacts dropdown). If you previously used a subscription plugin, you can export the emails and import them into MailChimp. Note that when someone subscribes, MailChimp will send them old posts going back a day/week/month if you have chosen to send daily/weekly/monthly. I also sent an email to all subscribers (using a separate, one-time campaign in MailChimp) that explained why they were receiving the email, that I was changing to a new system, and that they could now choose which categories to subscribe to. 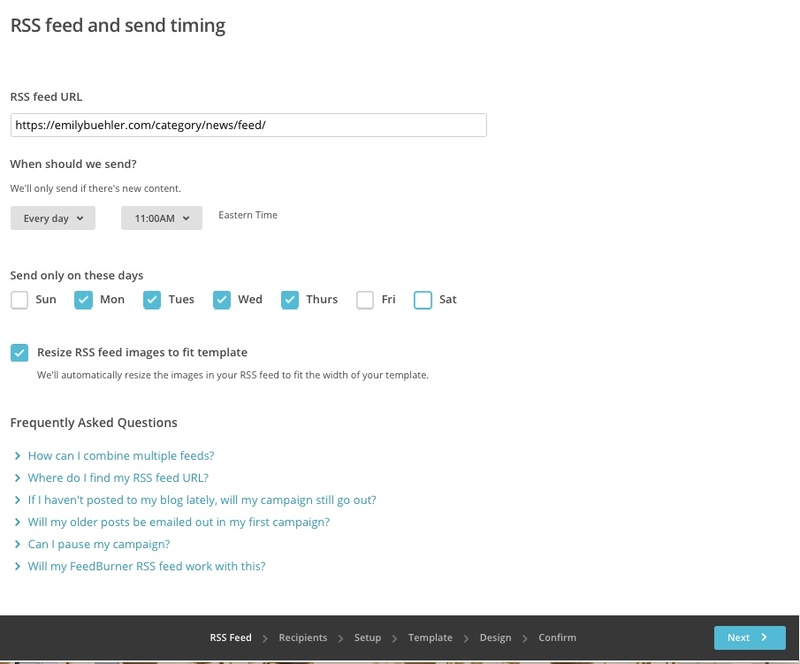 So, to sum up, you now have a MailChimp campaign set up for each category on your blog. When you post in a category (e.g., “News”), the post goes into the News feed, which MailChimp picks up. The RSS to Email campaign you created in MailChimp for the News feed creates an email that is sent to everyone in the News segment, which is everyone who subscribed to the News category on your blog. Yay! Right now, the notification emails are set to go at lunchtime on most weekdays. I think this will work because I don’t post constantly. If I started to post multiple times per week, I would switch to a weekly send time, to announce multiple posts at once. However, MailChimp does not have an easy way to combine the notifications from different categories, so someone who subscribes to multiple categories would receive multiple weekly digests, if I use a weekly send time. I’m not going to worry about this for now. I hope these instructions help anyone else who wants to add the ability to subscribe by category to their blog. *You might if your categories fall into different types—like if you had an author blog AND a plumber blog, and you wanted a set of groups/categories under each. **After taking the screen captures, I streamlined my categories and removed two. ***This is not relevant to the current process, but it is worth looking at the Form builder, which is where you would make a “free-standing” sign-up form; you could then send interested people to this form via a link. There are also items like the confirmation email subscribers receive, which you may want to customize. There are a lot of items here, and I am not clear on which ones get used when. Another option is a pop-up form, but I did not want anything popping up on my website, because pop-ups have become common and I find them annoying. ****I had some trouble with the campaign for the Thoughts category. I wondered if the punctuation in the category name might be causing the feed not to work, so I changed the category from Emily’s Thoughts to Thoughts. Use simple names to avoid possible glitches. *****I’m not totally sure how many days back a campaign will look for posts. Presumably a weekly send time will make the campaign look back a week. Some of my “daily” send times did not work unless I posted the blog within 24 hours of the send time; but other daily send times did look back many days. My current best guess is that selecting multiple days but not every day results in some weirdness. This entry was posted in For Authors on September 21, 2018 by Emily.